Coenzymated™ B-6 Sublingual 25 mg 120 Tablets from Source Naturals may aid in the process of making serotonin and norepinephrine. These are neurotransmitters that transmit signals in the brain. Vitamin B-6 is a water-soluble vitamin and is a part of the vitamin B complex group. Vitamins cannot be assimilated in their pure form and need to be in their active coenzyme forms to be utilized by the body. 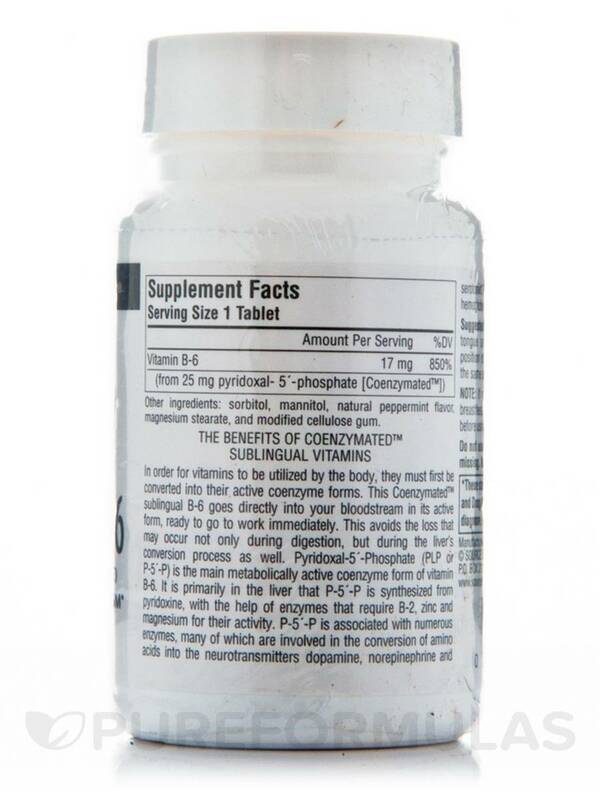 The active form of B-6 is called pyridoxal phosphate (PLP) and the supplement from Source Naturals contains a specially Coenzymated™ form that is ready to start working immediately. The PLP in the supplement from Source Naturals works to activate over 100 enzymes that may be involved in the conversion of amino acids into the neurotransmitters dopamine‚ norepinephrine‚ and serotonin. PLP is also required for the synthesis of the hemoglobin molecule and plays an important role in regulating homocysteine levels. Pyridoxal phosphate serves as a coenzyme for the enzyme ALA synthase and may aid in the synthesis of hemoglobin. 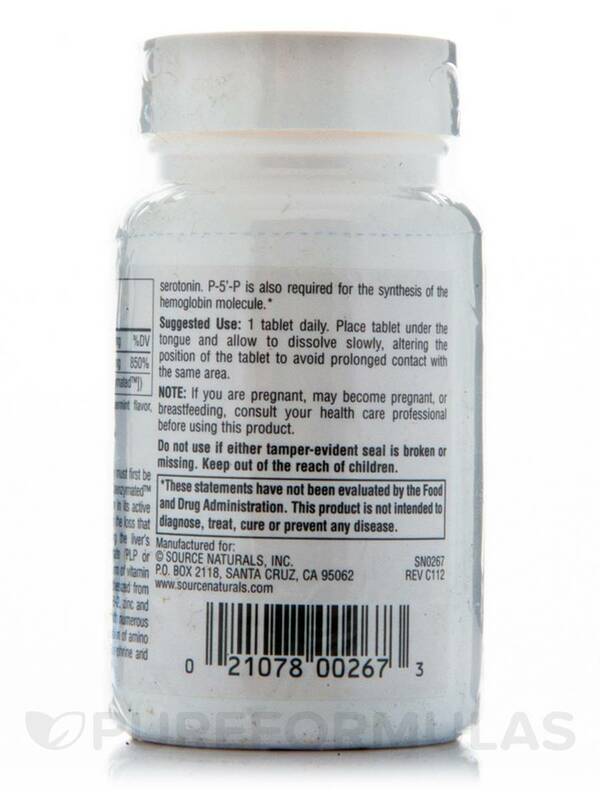 The Coenzymated™ B-6 Sublingual 25 mg 120 Tablets from Source Naturals may also enhance the oxygen binding of hemoglobin. Vitamin B-6 deficiency‚ in adults‚ may affect the nerves‚ skin‚ mucous membranes‚ and circulatory system. In children‚ the central nervous system may be affected. Major sources of vitamin B-6 include grains‚ legumes‚ carrots‚ spinach‚ peas‚ potatoes‚ milk‚ cheese‚ eggs‚ fish‚ meat‚ and flour. When it is difficult to incorporate these foods into your daily diet‚ you could rely on the Coenzymated™ B-6 Sublingual 25 mg 120 Tablets from Source Naturals. Sorbitol‚ mannitol‚ natural peppermint flavor‚ magnesium stearate‚ and modified cellulose gum. 1 tablet daily. Place tablet under the tongue and allow to dissolve slowly‚ altering the position of the tablet to avoid prolonged contact with the same area. I bought this Coenzymated B-6 Sublingual 25 mg - 120 Tablets because I need B6 and liked the idea of a sublingual (feel like I don't absorb things), but after using it in place of one 20 mg. capsule, my trigger finger has returned, so I don't believe it is as effective. I don't really care for the peppermint taste either. 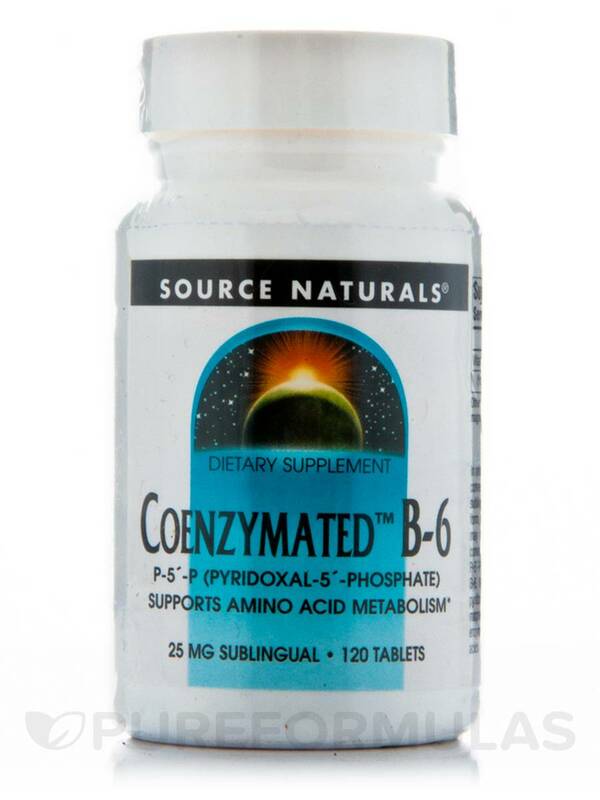 Being the coenzymated form of B6 it is ready to be used by your body. I had never used it before but now would use no other type of B6. It is absorbed quickly and put to use.